St. Lawrence is bringing AIC head coach Eric Lang and Northeastern associate head coach Jerry Keefe in for interviews, sources tell CHN. The search could certainly expand, but at least right now, Lang and Keefe are the starting point. Lang and Keefe aren’t surprise candidates. Lang, 43, is still considered a “young” coach and he has head-coaching experience, which it seems like SLU is prioritizing with these two as primary candidates. Keefe, you’ll say, hasn’t been a head coach at the college level. But ask around. Everyone says he is essentially a second head coach at Northeastern along with Jim Madigan. 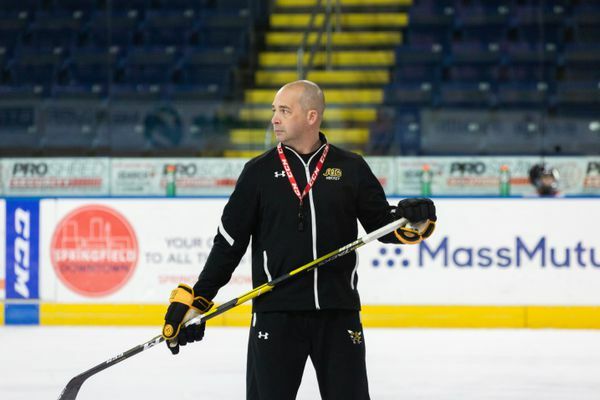 Lang took the AIC program from death’s door three years ago to where it was this season, when the Yellow Jackets won Atlantic Hockey and upset No. 1 St. Cloud State in the NCAA Tournament (they also nearly beat Denver to reach the Frozen Four). Lang has a proven track record of turning a program with limited resources into a contender. He knows that dynamic. Keefe makes sense for St. Lawrence as well, given Northeastern’s success. With the success the Huskies have had since Keefe and Madigan arrived, Keefe should be a candidate everywhere there’s an opening. What remains to be seen is how much interest Keefe might have in St. Lawrence. If you are asked to interview for a head-coaching job, and you’re not a head coach, you take the interview. But, Keefe is in a good place and has a good thing going with the Huskies. Madigan clearly values his contributions to the program, and he was given a five-year extension prior to the start of the season (along with Madigan). Assistant coaches don’t get five-year extensions very often. I’m guessing Northeastern is compensating Keefe well for his contributions, if they were willing to extend him a five-year deal. However, how long is Keefe willing to wait for the Northeastern top job? We said that St. Lawrence would be a job that could attract top candidates — especially with the renovations to Appleton Arena ongoing — so it’s not surprising that someone with Keefe’s resume could be interested. 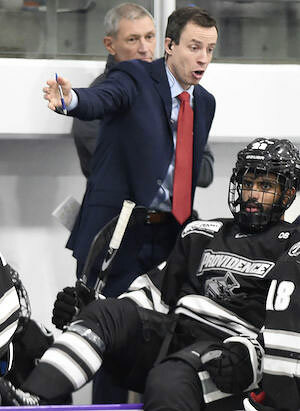 The biggest surprise, from sources we’ve spoken to, is that Providence associate head coach Kris Mayotte hasn’t been extended an in-person interview. Mayotte has experience at St. Lawrence, coaching under Greg Carvel, and has since been under the learning tree of Providence head coach Nate Leaman. Both of Mayotte’s primary coaching mentors just led their team to the Frozen Four. Mayotte was on staff with one of those teams. Mayotte has a lot of experience dealing with issues that face St. Lawrence. He was a Division I athlete on a Division III campus at Union (the same is true for St. Lawrence) and he was on staff at a D-I program on a D-III campus when he was coaching the Saints with Carvel. He knows how that works and how it all fits together. At the same time, he knows what it looks like at Providence. The Friars have made huge infrastructure improvements since Leaman took over, and it was at Leaman’s direction. Mayotte has been along for that ride. He could help guide St. Lawrence and get to that next level as a program, if it wants to get there. Like we wrote when the position opened up, the Saints have a lot of great choices. Sources have said it’s possible the university has a coach in place by the time the annual American Hockey Coaches Association convention begins in Naples, Fla. on May 1. You are currently browsing the College Hockey News: Blog weblog archives for April, 2019.